Valentine's Day Ideas: 8 DIY Gifts! 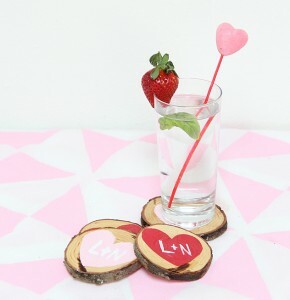 Valentine’s Day Ideas: 8 DIY Gifts! It’s hard to believe that Valentine’s Day is just around the corner but it is! I love celebrating Valentine’s Day every year…whether I’m dating someone or not. This holiday is about showing love to your friends and family. To do this I make homemade cards or small gifts. Here are some fun Valentine’s Day ideas for DIY gifts that your friends and family will actually want! 8 Valentine’s Day Ideas: DIY Gifts They’ll Actually Want! Photo via Heart. Love. Always. 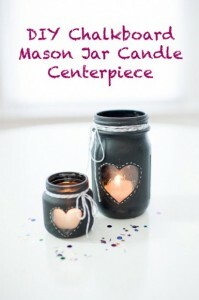 Chalkboard Mason Jar Candle Centerpiece – These centerpieces are made with used baby food jars (how cute is that small centerpiece!?) and a mason jar. Use chalkboard paint, twine, chalk and painter’s tape to make this perfectly festive candle holder. Find the full picture tutorial here. Photo via Crazy About My Bah Bah. DIY Valentine’s Day Bath Bombs – What’s great about this DIY gift is that you probably have many of the ingredients in your kitchen pantry. To make these bath bombs you’ll need baking soda, cornstarch, coconut butter, essential oil, citric acid, a spray bottle of witch hazel, and a silicone mold. Most of these I have on hand right now! You can also add red food coloring to increase the Valentine’s Day look. This gift is even better for those making many gifts. A small bag with two or three of these is a nice gift AND this recipe makes 24! Photo via A Bubbly Life. Wooden Coasters – Have any friends who love the outdoors? Then we’ve found you the perfect gift! This project uses a wood log, saw, sandpaper, polyurethane clear gloss, heart stencils, and paint to create a real DIY masterpiece. What’s great about this gift is that they’d be perfect for use year long even though they have a subtle and adorable Valentine’s Day theme. For the in-depth picture tutorial head here. Photo via Thirty Handmade Days. 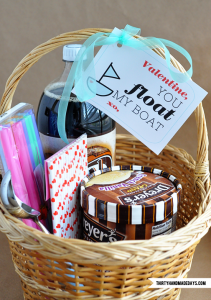 Root Beer Float Kit – Making this kit is really simple! 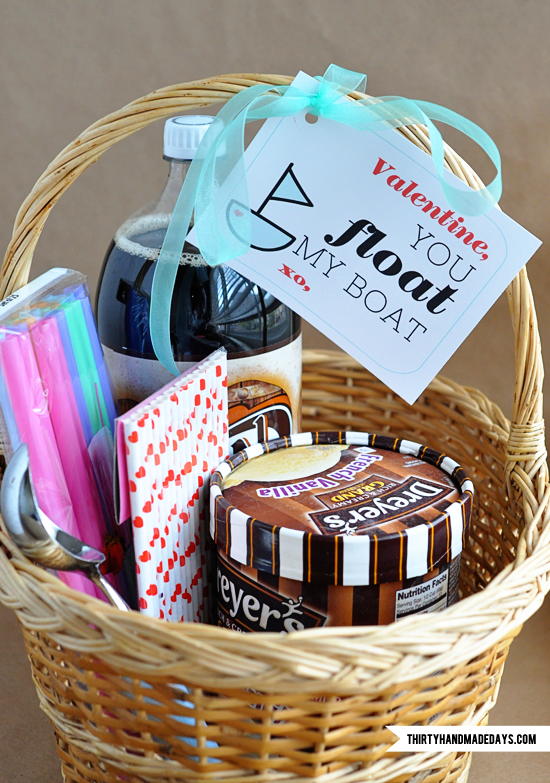 You’ll just need a basket or bucket, root beer, vanilla ice cream, ice cream scoop, and some fun straws. Throw them all together and tie on this FREE printable and you’ve got your kit. And in this freezing winter weather, you won’t have to worry about the ice cream melting. Yum! Photo via Sunny with a Chance of Sprinkles. DIY Chalkboard Mug – Remember that chalkboard paint you used earlier? Well, here’s a project where you can use it again! 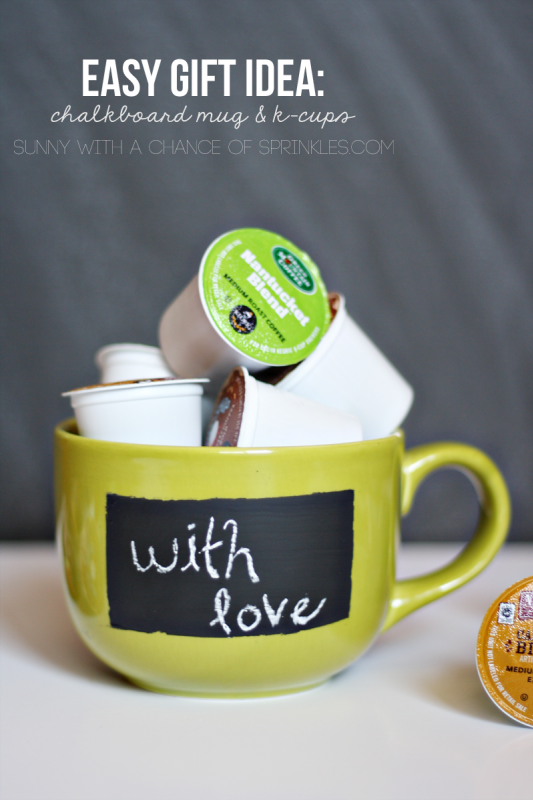 To make this cute chalkboard mug all you need is painter’s tape, chalkboard paint, and a paintbrush. Fill it with K-cups or coffee beans (or chocolate covered espresso beans!) to make the coffee lover in your life swoon! For complete directions head here. Photo via Home Cooking Memories. S’mores in a Jar – Who doesn’t love S’mores!? No one that’s who! And that’s why this is the perfect quick Valentine’s Day gift. Last summer we made these same jars for my cousin’s wedding and they were a HUGE hit! Even better, they were super cheap to make. 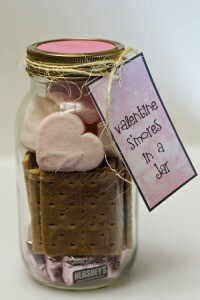 For this craft you’ll just need a mason jar, graham crackers, chocolate, and marshmallows (you can use heart shaped or regular). Place them all in the jar and tie a tag with some twine. Fun and quick! 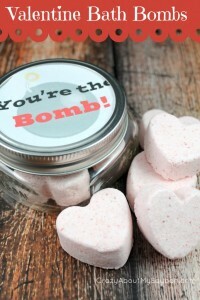 You Rule Valentines – Looking for a cute non-candy Valentine’s Day gift for your child’s class? 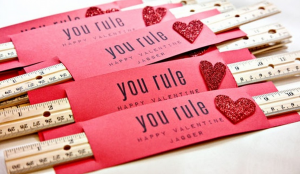 This DIY ruler gift is perfect! You can usually find packs of rulers on sale at walmart or Target. Keep an eye out in the next few weeks and you should be able to score some for 30-40 cents each! Once you’ve got your rulers just print this FREE printable onto some red construction. Cut a slit on either side and slide the rule through. Wah-lah! You’re done. 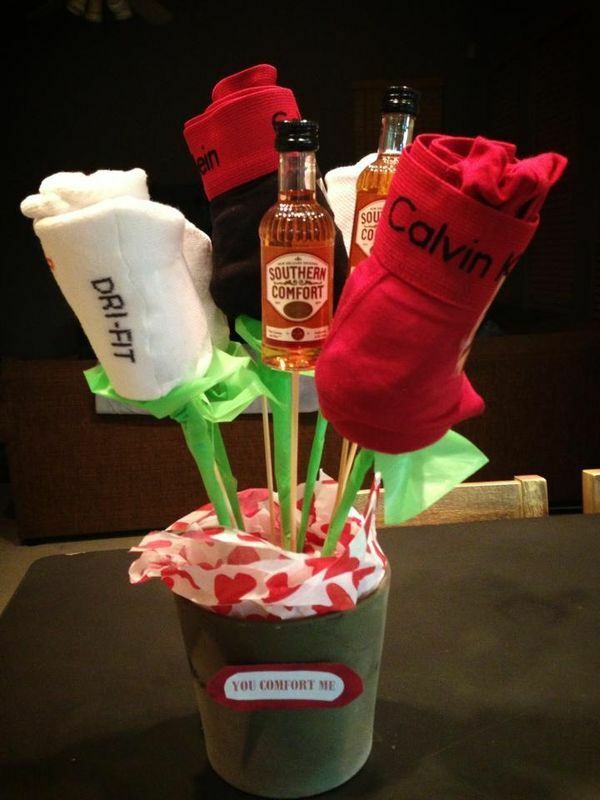 DIY Man Bouquet – I made one of these for my boyfriend last year and was a huge hit! It cost me about $15 to make in total but your choice of gifts can add or deduct cost. For this project you’ll need a medium basket, small dowel rods, or kabob sticks, styrofoam, tape and various treats. I chose mini bottles of my boyfriend’s favorite alcohol, his favorite candies, and socks. Customizing it is half the fun! What gifts are you giving or making for Valentine’s Day?